A tibial plateau fracture is a break of the bone at the top part of the tibia (shin bone). That bone makes up the bottom part of the knee. You typically suffer this fracture with a direct blow or impact to your foot that drives the tibial plateau into the rest of your knee, such as a fall. Occasionally, a tibial plateau fracture that is nondisplaced, and lines up perfectly, can heal without surgery. If it is out of place even a few millimeters, the surgeon will likely choose to fix it surgically. Most of the time, the surgeon opens the knee to put the fracture pieces back into good position. He then holds the fracture with screws or a plate and screws. Initially the surgeon might keep you from putting weight on your leg, so you might walk in a brace and with crutches. Then as the fracture heals, you add more weight and work on knee motion and strength. Working with a physical therapist can be helpful. 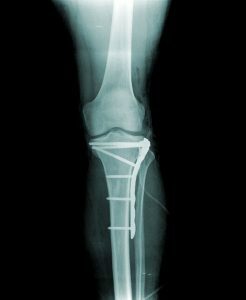 As the fracture finishes healing, you should be able to start walking and jogging before progress back to exercise and sports. The entire process can take 4 to 6 months or more.